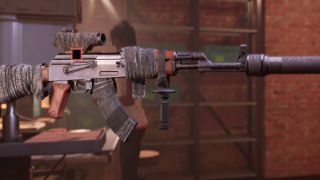 The Division 2 Merciless Exotic Rifle is one of the most unique weapons in The Division 2, because it uses a completely different mechanic in combat. It's one of a number of Division 2 Exotics available and if you want to have the full collection, you'll need to follow this guide on how to get Merciless in The Division 2. Read on for everything you need to know about Division 2 Merciless, the Exotic Rifle. Binary Trigger: This weapon is equipped with a binary trigger that fires on trigger pull and release. Guerrilla Warfare: Pulling the trigger fires primer rounds that stay embedded in an enemy. Releasing the trigger fires detonator rounds that detonate all primers on the enemy it hits. Each primer detonated gains +75% damage per primer detonated. Only one enemy can have primers and at most five primers can be embedded. Brutality: While holstered, landing a shot has a 5% chance to deal +20% damage as explosive damage. This is a system similar to ones found in games like Anthem and Mass Effect, and can cause some serious damage if you trigger five primers simultaneously. We haven't got our hands on it ourselves yet so we can't vouch for how effective it is, but it sounds like it could easily become one of the best guns in The Division 2. But how do you get it? Obtaining the Merciless in The Division 2 is different to most of the other Exotics, because you have to rely on random drops a lot more, rather than guaranteed drops from tough enemies. It's a Hyena weapon so the way you get the Merciless is by killing Hyena bosses. It's possible to obtain the Merciless on normal difficulty, but we'd recommend repeating Hyena missions on Hard or Challenging to increase the number of drops you get. As for which missions are eligible, we'd recommend trying the Jefferson Trade Center and Bank Headquarters missions. There's also a chance you can get it from Daily VIP missions, but you can run and become more familiar with the standard missions available so your best bet will be repeating those. That's all you need to do! Keep killing Hyena bosses until the Merciless rifle drops then when you get it, you're in possession of a gun that can deal over 1.2 million damage at a time. Make sure you get some sweet Division 2 dyes to bling it out with your apparel!